Mary began a flurry of employment lawsuits in her first years at GLAD – putting the Commonwealth on notice that the new law would be – and could be – enforced to start to protect our community members in their jobs. 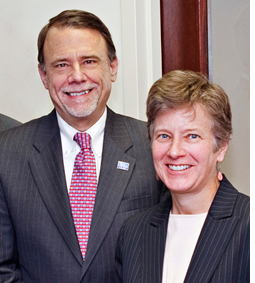 I have had the honor to observe Mary Bonauto’s work for 25 years – as a GLAD Board member, a GLAD Litigation Committee member, as Executive Director and as a colleague on the GLAD legal staff. What comes first to mind in thinking about Mary is her tenacity, thoroughness and fearlessness. It was quite a different world in some ways back in the 1990’s – particularly with respect to the various arms of the government, whether federal, state or local. Police departments were generally dismissive of – if not blatantly oppressive to – the gay community. And Mary went toe to toe with the police – as the MBTA police conducted stings in various rail stations to Boston and Cambridge, police entrapped men in private, outdoor cruising areas, and the State Police rousted gay men from public rest areas for simply sitting in a car. She helped reform procedures so that the police obeyed the law, treated gay men with respect and trained all officers accordingly. And there was her work in the schools – as when a Massachusetts school cancelled a display called Love Makes A Family and when a New Hampshire school district adopted a “No Promo Homo” policy and when schools throughout New England refused to allow the formation of Gay/Straight Alliances. Mary brought lawsuit after lawsuit – and won. Mary tackled – and still tackles – everything. She is unafraid regardless of the opponent. Indeed, it usually turns out that the other side comes to heel. Not only because we are right but also because Mary outworks everyone, does not give up and fights with such passion for all of us. And there was the shameful way that the military treated its gay and lesbian soldiers and even college students in ROTC. Again, Mary sued and ended some of the injustice perpetrated by the federal government’s unjust treatment of our community. Want to share your own thoughts about Mary, and everything our community has accomplished together in the past 25 years? Beyond those governmental actors, Mary started her career at GLAD focusing on discriminatory employers. With the adoption of the country’s second sexual orientation non-discrimination law in Massachusetts, Mary began a flurry of employment lawsuits in her first years at GLAD – putting the Commonwealth on notice that the new law would be – and could be – enforced to start to protect our community members in their jobs. There was so much going on in the law that was wrong in those days. Parents treated as legal strangers to their children. Loving couples treated as legal strangers to each other. Discrimination against people with HIV. Traditional exclusions of gay people treated as simply the “way things were meant to be” – whether the Boy Scouts, the military or marriage. And on and on.